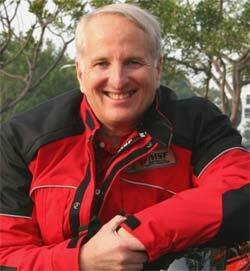 Hello, I’m Dr. Ray Ochs, the director of training systems for the Motorcycle Safety Foundation. If you’ve taken a rider education course in the United States, chances are that your class used the MSF curriculum, which is based on decades of research, study and practical experience. The MSF is a not-for-profit organization dedicated to rider training, education and improving rider safety. This entry was posted in General Postings and tagged gold wing, goldwing, motorcycle, MSF, safety, Safety Tip of the Day. Bookmark the permalink.